Understated elegance at its best! Professional renovation & expansion with 4-car garage, 10ft first floor ceilings. Only best materials, soothing palettes, finest finishes & open floor plan create a restive setting to be appreciated by all. 1st floor guest suite allows for privacy & related living. 2 Kitchens for entertaining. Volume ceilings, skylights bring natural light inside. Family theatre with fireplace & wet bar for Family Movie Nights. Spacious and naturally flowing rooms for all to enjoy. Amazing master suite. Private, perennial landscaped exterior w/tiered paver patios, fire pit. Located steps to Brook Forest Elementary School & walking paths connect to award winning Park District, Bath & Tennis and Library. 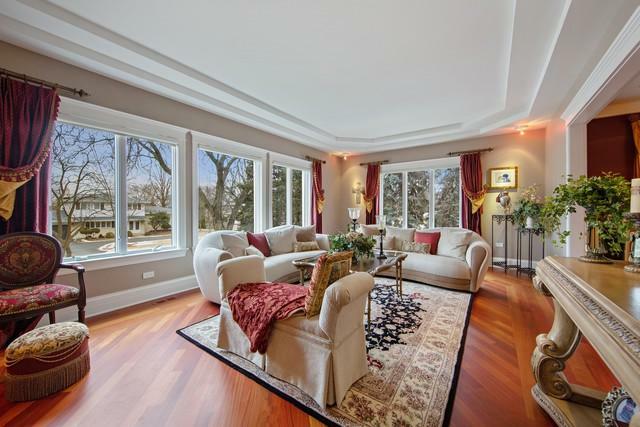 Minutes to shopping, restaurants & highways connecting to downtown Chicago's museums, sports, lakefront & both airports. Truly a wonderful combination of luxury living & prime location to local and regional amenities. Enjoy everyday. Wonderful to entertain! Opportunity!